Baba is You is a ridiculously innovative puzzle game where you push words around like blocks and see how they interact with each other. Sadly, it’s not available on iOS yet, but it’s a testament to how much I’m enjoying it that I’m willing to play on my PC. I’ve been recording my playthrough, but I also started making straight walkthrough videos for those who don’t want to watch me figure things out. This page will get you through all the levels in the Temple Ruins area. Click on the links for the other areas if this isn’t what you’re looking for. If you need help with levels I haven’t added yet, feel free to ask for extra help in the comments section. You can watch my video for Temple Ruins here or continue below for my step-by-step guide. Push IS and WEAK under SKULL to make SKULL IS WEAK. Then push the rock through two of the skulls below to break through them. Then push IS and WEAK down under ROCK to make ROCK IS WEAK. Push the rock blocking your way to break it apart and then touch the flag to win. You’re playing as Keke here. Move up and let Baba run into the water, where he’ll sink and leave a rock behind. This is due to a new mechanic related to the word HAS. All you need to do is swap ROCK and BABA so you get ROCK HAS BABA and ROCK IS MOVE. Then the rock will move right and sink, leaving a Baba behind. Then just push BABA left to get BABA IS MOVE. Let Baba move through the the last bit of water blocking your way. Go touch the flag to win. First, push BOX left to make BOX IS YOU. Then move the box across the water and break up LOVE IS MELT. Push MELT up near BOX but don’t use it yet. Push LOVE back right to make LOVE IS YOU. Push BOX back right to make BOX IS PUSH. Push the box into the water. Then make BOX IS MELT to melt the box and reveal the flag. Touch the flag to win. This one’s tricky, but a really clever solution. First, move BOX and IS down to make BOX IS KEKE. Then walk up so one of the Kekes hits the small drop of water. Both Keke and the water will disappear. Use the other Keke to push HAS and BOX down below KEKE to make KEKE HAS BOX. Now, just move BOX and IS to the left of KEKE to make BOX IS KEKE IS YOU. Now you can walk straight through the river without any trouble. Touch the flag to win! This one isn’t too difficult but takes a lot of pushing words around. So bear with me. First, move HAS and BOX under BABA to make BABA HAS BOX. Move BOX and IS above YOU to make BOX IS YOU. And last, add AND and WEAK to make BABA IS YOU AND WEAK. Now walk into any obstacle to break Baba, replacing him with a box. Next, move WEAK temporarily so you don’t accidentally kill yourself. Then make BOX IS YOU AND and KEY IS YOU. Move BOX and HAS to the left of KEY to make BOX HAS KEY. Move WEAK back into place to make BOX IS YOU AND WEAK. Smash yourself to turn into a key. Now just one more step. Move the words around to make KEY IS YOU AND HAS BOX and also BOX IS YOU. Make sure you break up BOX IS WEAK. Now, as the key, unlock the door and turn into a box. As the box, touch the flag to win. Push BOX IS WEAK straight up. Push BOX, KEY and AND up to make BOX HAS KEY AND. Push IS and PUSH up under BOX to make BOX IS PUSH. Now you should have BOX HAS KEY AND BOX and BOX IS WEAK and BOX IS PUSH. Then push the box against the first door to break it open and reveal the key. Push IS and PUSH right to make KEY IS PUSH. Then just push the key through both doors, since it will turn into a box and keep turning into a key. Then touch the heart to win. Ok, this is not as bad as it looks. First, push the top ghost down to right above the bottom ghost. Then push both ghosts right once so they’re facing right. Then move IS and PUSH anywhere to the right of the ghosts, with IS above PUSH. Now, get GHOST and IS and MOVE out of their path and push them together to make GHOST IS MOVE. Stay right by MOVE and press the spacebar until the ghosts push IS MOVE one space before SKULL. Then break up GHOST IS MOVE so you get SKULL IS PUSH. Now you can push your way through the skulls. You still need something to be WIN. It’s up to you, but I chose to move SKULL up and make SKULL IS WIN. Then just touch a skull to win. This one’s a little annoying. The basic idea is that you first need to move KEKE left to make KEKE IS YOU. Then, as Keke, push all the words so that KEKE is lined up with the door. Then push BABA right again to make BABA IS YOU. As Baba, push all the words down so they’re out of Keke’s way. Make KEKE HAS BABA, Then push IS and MOVE up under KEKE to make KEKE IS MOVE. Now here comes the tricky part. As Baba, move left and also press the spacebar to let Keke move into the door to unlock it. He’ll also turn into Baba. So now you control two Babas. And you need to move them both in a way that allows you to rearrange the words to BABA IS MOVE without letting either Baba touch water and sink. It’s not easy. Once you do that, the right Baba should be able to cross the right river without any trouble. Touch the flag to win! This is pretty easy. Make WALL IS ROCK. Then get a bunch of the rocks out of the way and push IS AND WIN up under the ROCK that’s enclosed to get ROCK IS WIN. And last, just push the remaining ROCK and IS above YOU to make ROCK IS YOU. That’s it! This one’s crazy. First, break up BABA IS MOVE when none of the Babas are against the wall. Use the spacebar to help. Then, push KEKE IS YOU up so YOU is lined up with GRASS. Then make BABA IS PUSH and push all three BABAs somewhere along the left side of KEKE IS YOU. Make sure they’re all facing right. Now the fun part. Break up BABA IS PUSH and move the IS PUSH to the right of KEKE to make KEKE IS PUSH. Push MOVE up under the IS. And last, push BABA up to make BABA IS MOVE. You want Keke (you) to be under BABA and to the left of YOU. Now press the spacebar to make the Babas push everything, including you, over to the right. It should all line up nicely and you can run down and touch the flag to win. And that’s all for Temple Ruins! Click here for Forest of Fall or choose one of the other areas below. 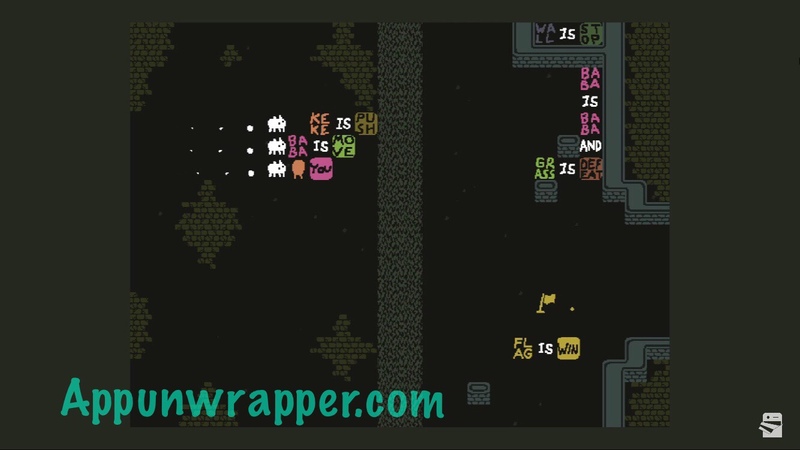 Perilous Gang : Just make the ghosts push IS and PUSH under SKULL to make SKULL IS PUSH. Push the skulls, collect WIN, make GHOST IS WIN and win.